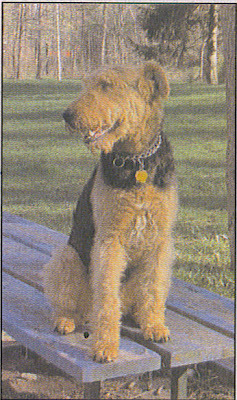 Today, I learned the passing of yet another great DALE named "Diamond"
Diamond was surrendered to ATRA - the wonderful Airedale Terrier Rescue & Adoption back in December 2006 with a left eye that was blinded by a tumor. 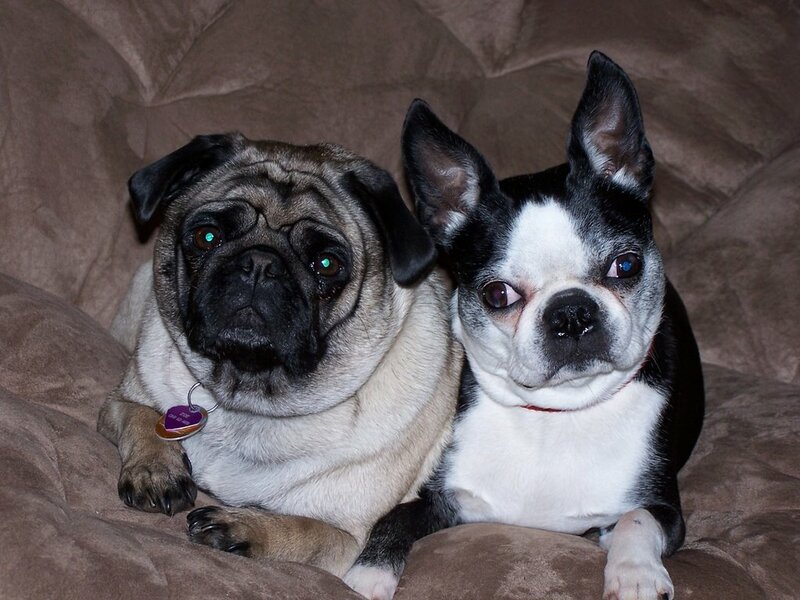 After her eye removal surgery, Diamond found her forever home with Wolfgang and Helene Kayser. 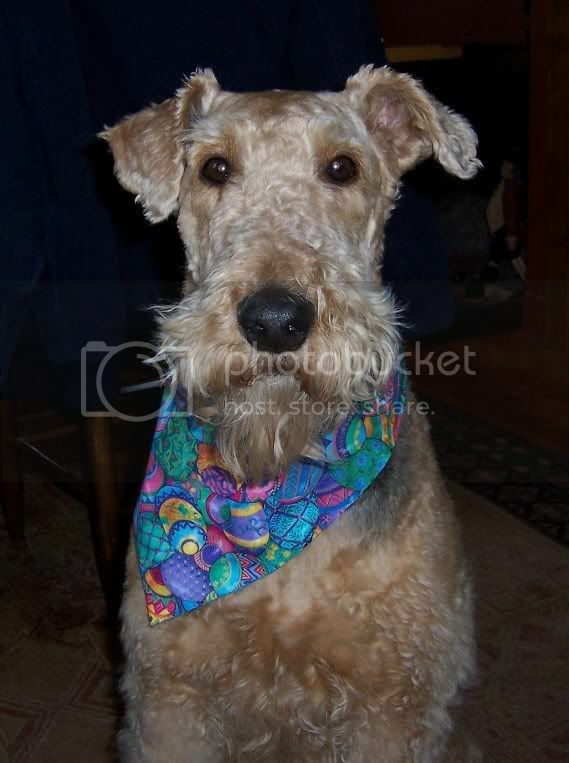 Diamond was only with her forever family for a short 7 months before she made the trip over the Rainbow Bridge, but in that 7 months time, she worked her Airedale magic and clung onto the hearts of Wolfgang and Helene. "What a smart and pretty girl she is! We are inordinately proud of her and to say that we love her is very much an understatement! We would never let her go, she is part of us and this is where she belongs! Diamond, our girl, would second that motion with alacrity!" I have yet to have to go through the pain of losing someone/somepup close to me so I can't say I know exactly what the heartbreak Diamond and Oscar's guardians are going through feels like. But, I know, we, as human beings were born with strong hearts. We grew up knowing we were going to live a long time. It is our responsibility to bear the suffering of loving others - others who do not have the long life expectancy equal to us. Just like I cry when I think about the inevitable that comes with sharing my life with a heart dog - my Sunshade. It is difficult, and we cry. But once we cry it out loud, and say "as long as we will be together again, and you will get to meet all the new friends that I will bring", you must lift your head and look around. For there will be another that is meant to be for you. Be brave fellow mommies and daddies! Katy, Martin, Wolfgang, Helene, Ann and Ellen, my heart is with you all. Thank you, Elaine! I'm sending this link to Wolfgang and to Diamond's foster mum, Ann. I know they will be as teary as I am right now, but at the same time will be pleased to see our wonderful girl recognized. Our consolation is that Diamond had the best seven months of her life after her "family" surrendered her to ATRA. So sad to hear about Diamond. Well sad Elaine, we have to be brave again after the tears. it really hurts when someone/pup close leaves. like u and miss sunshade, i had a little 'sister' with whom i spent most of my growing up years with because there was no one else at home most times. it was very, very hard to say goodbye when it was time for my sherry mew to go after 16 years and i was certain i would never love another. 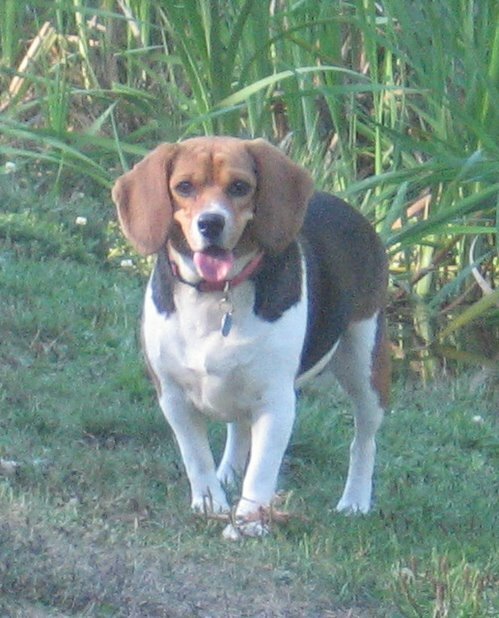 for many years, i just couldn't look at another dog without thinking of my sherry mew and feeling the tears come to my eyes. but perhaps this is how things should better be. 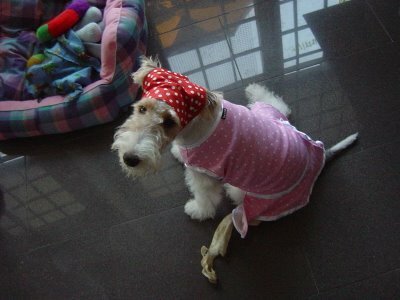 for pups to go before mommies, so that they can be well taken care of and loved right till the end. and i did love again, and i am thankful for it although deep down, i dread the moment – hopefully a long long time from now – when i will have to hug fee's lifeless body and bid her farewell the same way i said goodbye to sherry mew. this is an unusually sad week. as we grieve for oscar and then diamond, many of us re-live our grief for our old loves and feel the frailty of life once again. let us all be mindful, but not live in fear, of life's vulnerability. let's just love one day at a time. i believe we'll all come full circle and meet again in the end. take care. i know you are a sensitive soul and how this must be hanging very heavily in your mind. Well said! 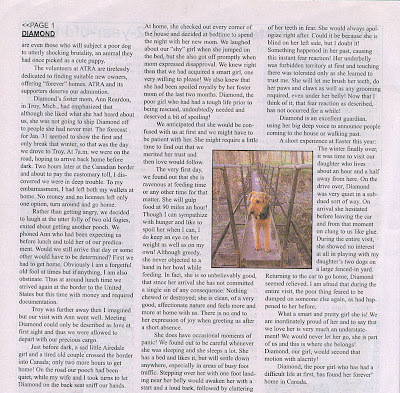 Thank you for sharing Diamond's story. Awww, Diamond was just a sweet & bootiful Aire-dale girl. She was very very lucky to live with her new caring owners for seven months. Thanks for sharing this with us Miss Sunshade! I went slightly off kilter after hearing about Oscar.....I had what my daughter calls "a hissy fit" about dog blogging - felt we could not post funny stuff after all the terrible Oscar sadness. 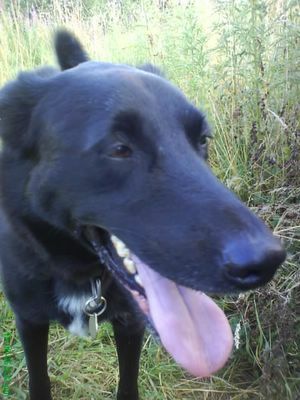 But all the lovely Dog Bloggers came to our rescue, including Oscar's sweetheart Mama. Such kind and loving people all you Dog Bloggers. 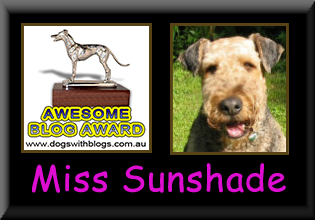 Thank you for letting us share the life of Miss Sunshade and Jaffa, and you and yours. 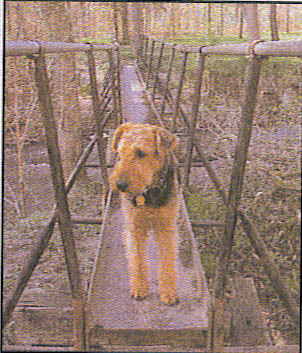 We will Blog On, Oscar would have hated us to be sad - and his Mama tells me she wants to read all our adventures too. love and much light from Jeannie and Marvin in Bonnie and very Sunny and beautiful Scotland today. oooh and thank you for sharing the story of Diamond. Very moving. Our heart ache for Wolfgang and Helene. What a beautiful girl Diamond was. Her stay was too short with them! I'm sure Oscar would have welcomed Diamond at the bridge. 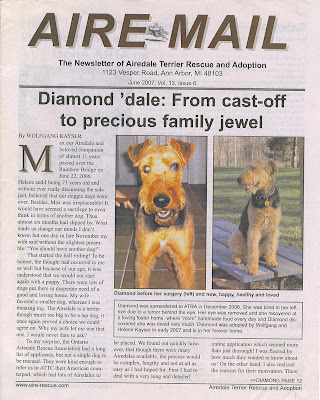 Thank you for sharing Diamond's story...that's what rescue is about..time is not important - it how the Airedale's touch your heart and quickly becomes as important as air - and you just don't think about breathing you just breath. Sometimes when you lose them it just knocks the air out of you and you can't quite catch your breath. Hearts break but rest of sure your fuzzy fur baby will not let you suffer long....Oscar and Diamond and all the others are looking for the right LOVE to send to mend the broken hearts. They make love easy and I think thats why it hurts so much to lose them. "touch your heart and quickly becomes as important as air - and you just don't think about breathing you just breathe. Sometimes when you lose them it just knocks the air out of you and you can't quite catch your breath." I don't know when I've read something so simple and so true. It's made my day better. May Diamond and Oscar find each other over the Rainbow Bridge. Elaine, thank you so much for sharing Diamond's story. The previous post, tribute to Oscar is great and I cried. We are so happy that Diamond found his forever home. Even if it was only for 7 months, it was full of love. Our hearts go out to Diamonds family. Sunshade: Thank you for sharing Diamond's story, and for your tribute to Oscar. Muzzer is sad, but she loves all the bloggers and their humans. Im sorry bout DIamond and thanks for sharing her story. 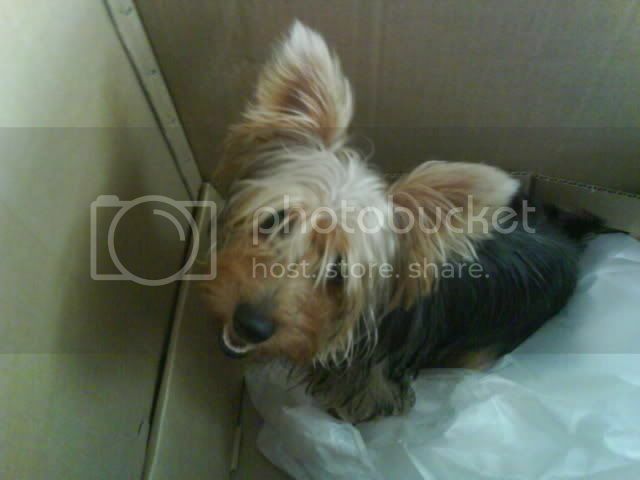 She is a beautiful dog...but Im sure she will has a happy life up the rainbow bridge with Oscar, fufu & the rest. Its not a goodbye yet...thats what you said, and it keep me & BenBen strong. We feel so sorry for Diamond. We always hate those irresponsible hooman who give up on their pets when they fell ill. It always make us feel really sad to read about such story. RIP, Diamond. Run free and have fun over the Rainbow Bridge. We will get to meet one day. So glad to read that Diamond's final year was in such loving care. A special message to Diamond - seek out my happy boy Buster in dog heaven. He always loved the ladies. Then, my Moxie, for she'll protect you and remind you there's nothing to be afraid of. That's what she does. hey sis, that was quite a touching letter and i can tell you have touched many people's hearts and i hope the people who read this will do wat it says.